Random House Books for Young Readers, 9780553522785, 112pp. 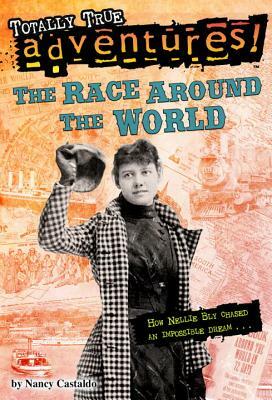 Does Nellie Bly have what it takes to race around the world? Travel to all corners of the globe in this action-packed Totally True Adventure. When Nellie Bly read Around the World in Eighty Days by Jules Verne, she had an amazing idea. What if she traveled around the world in real life, and did it in less than eighty days? In 1889, people doubted it could be done—especially by a woman. But with one small bag and a sturdy coat, Nellie set out anyway. Soon the whole world was rooting for her. Could she make it back home in time? This nonfiction chapter book makes history exciting and accessible for younger readers and features illustrations, photographs, a map, Common Core connections, and additional Story Behind the Story facts. Perfect for readers of the I Survived series and the Who Was . . . ? series, Totally True Adventures are captivating nonfiction stories with not-to-be-missed bonus content. Nancy Castaldo is the author of several nonfiction books for children, including Sniffer Dogs: How Dogs (and Their Noses) Save the World, Mission Polar Bear Rescue, The Race Around The World, and The Story of Seeds: From Mendel’s Garden to Your Plate, and How There’s More of Less to Eat Around the World. She lives in New York’s Hudson Valley with her family.